The man behind the reboot is hoping his superhero will stick with audiences. Director Marc Webb (left) explores new dimensions of "The Amazing Spider-Man," aided and abetted by Emma Stone, Andrew Garfield and Rhys Ifans. Director Marc Webb’s spun his Spider-Man tale. He’s just waiting to see if audiences get caught up in it. The onetime music video helmer so impressed filmgoers, critics and – importantly – studio executives alike with his 2009 indie romance "500 Days of Summer" that he was tapped by Columbia Pictures to lead the creative charge in retooling its lucrative Spider-Man film franchise, based on the Marvel Comics’ friendly neighborhood wall-crawler. With “The Amazing Spider-Man,” the 37-year-old director attempts both to reset and jumpstart the property just a decade after the first film, recasting Peter Parker (Andrew Garfield) as a more angst-ridden character, reintroducing Spidey’s original comic book love interest Gwen Stacy (Emma Stone) and building much of the film’s foundation around the heretofore unexplained absence of Peter’s birth parents. As the film hits theaters, Webb tells PopcornBiz about when Spider-Man first captured his attention, how he got crucial insight from famed Spidey comic creators, why Gwen was the right girl for his film and how he hopes he’s built a foundation for more cinematic web-slinging to come. Sally Field, Martin Sheen, Rhys Ifans and Denis Leary chat at the Hollywood premiere of "The Amazing Spider-Man." They dish on their reactions to the film. Plus, Sally Field spills that she won't be watching the film anytime soon. Can you remember your very first entry point into the world of Spider-Man? It was probably before I had read a comic book. I think I'd just seen him on TV, or seen the image somewhere. I think as a kid you see this really cool suit – It's red and blue and colorful. It feels friendly. He's kind of a good-natured creature that can do amazing things. Then when you realize that there's a kid inside of that suit, it makes you feel empowered. Everyone wants to put on the mask and become something magnificent. Did you ever have an opportunity to sit down and talk to Spidey’s creator Stan Lee? The very first thing that I did when I got the job was get Stan Lee's number, and I asked him out to lunch. The first thing that Stan said was, "Let's talk about my cameo!" So from the outset that's kind of the relationship that I've had with him, but he's been a real great supporter. It goes beyond him being a genius. He just understands something, or he has an ability to conjure – Stan and [artist] Steve Ditko in this case – a character that's really transcendent. Brian Bendis did a job similar to yours in the comics when he reinvented and modernized Peter Parker for "Ultimate Spider-Man." He’s a key consultant to Marvel Studios now – did you talk to him at all? Yeah, I talked to Brian Bendis very early on. We talked about some of the nature of the relationships between Peter Parker and his peers. Brian was really valuable in encouraging me, and there are certain moments in the film that really came directly from conversations with Brian about how he viewed the character, how he felt the character would act in a contemporary environment. I think he understood the idea of the reboot. Listen, there's been so many writers and so many illustrators along the way that have reinvented or rediscovered "Spider-Man" that it felt like there was a great precedent for it. What led you to tap into an angst-ier side of Peter Parker for your film? When I look back at the comics that I loved, there was an attitude about Peter Parker. He has a little bit of that sarcastic wit, which I thought was so provocative and so fun to read. Really, I went back and I thought about the character and tried to build the character from the ground up, and I thought, "Well, what are the big moments in his life that really defined his character?" I kept on coming back to a single event that hadn't been explored cinematically before, and it's more significant than a spider bite, in my opinion. It's him getting left behind by his parents when he's six or seven years old. That would have a magnificent, huge impact on anybody. When that happens, it informs not only the narrative, but the inflection of the character. He's got this chip on his shoulder. Anybody who's left behind like that is going to have a problem with authority. They're not going to trust authority figures because authority figures have let them down. I felt like that was a really interesting side of the character, and it was a way for me to access that humor and that sarcastic wit that happens when he puts on the mask early on. But the other thing is that he has a heroic impulse from the very beginning. He just can't act on it physically, and he has an empathy for the underdog. That's the part of the character that I really adored and wanted to explore. Andrew Garfield seems to be very serious in his role as a custodian of Spider-Man, a character he’s loved since he was a child. Were you two always in lockstep with your view on the character? I think what Andrew did, he brought a lot of himself to it and his love for the character. That came through in a lot of different ways. For one thing, physically. He looked a lot like, I think, the Mark Bagley art in "Ultimate Spider-Man" in terms of the physicality. There's a lithe, sort of adolescent quality of that, the way his elbows work and the way his fingers work and the really expressive agility of the art work, I think, was really fantastic. But then there are the parts of Peter Parker, like the skateboarding, that's very much from Andrew. I like it when actors take possession of a character. They have to. 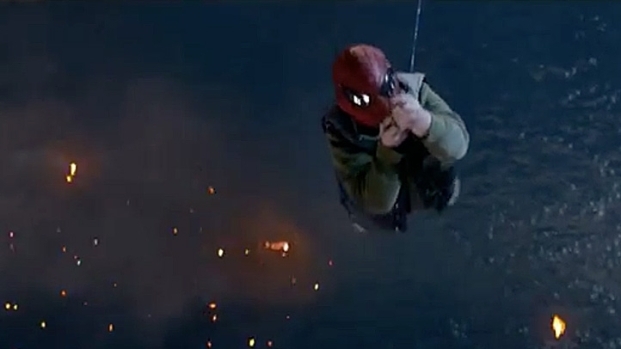 I've rarely seen that level of commitment in any actor, especially with one like Peter Parker. Gwen Stacy is known a little bit more for her ultimate fate than her character attributes, while Mary Jane over the years has become Spider-Man's seemingly destined love interest. What made you gravitate towards Gwen? In "The Ultimate Spider-Man" we see Gwen Stacy a little bit different, and I went back to look at [early] "The Amazing Spider-Man" [comics] to conjure the image of Gwen, but I thought that there was some real fun to be played with Gwen Stacy in terms of their dynamic. I also think that Gwen Stacy is different from Mary Jane in that Gwen Stacy fell in love with Peter Parker and not with Spider-Man. Mary Jane was sort of smitten by Spider-Man, by like, "Oh, who is this guy?" She kisses Spider-Man for the first time and not Peter Parker. This is a very different dynamic, and it sets off something that I think is really quite profound. As director you must’ve prayed to find the type of chemistry that Andrew and Emma have onscreen. Did it get even better than you expected as they got to know each other in the shooting of the film? Yeah. Listen, we screen-tested them together, and it was pretty obvious. They didn't know each other. They just had something kind of great. I don't know how to define it. They brought something in each other out, and I remember from that first screen test. Not only onscreen were they great, but in between takes you'd seem them laughing and making each other laugh. They got along really well, and it translated. I remember there was a very specific moment in the hallway where he's asking her out for the first time. They were both really loose and I wanted to give them the space to improvise or whatever, and it just became this very genuine moment, one that you would get in small movie, I think, where you had the flexibility and the commitment to spontaneity that you don't often get in big movies. I felt like that was really important to protect. I just lucked out.